Written for it’s over easy by New York Attorney Alyssa Rower, Esq. 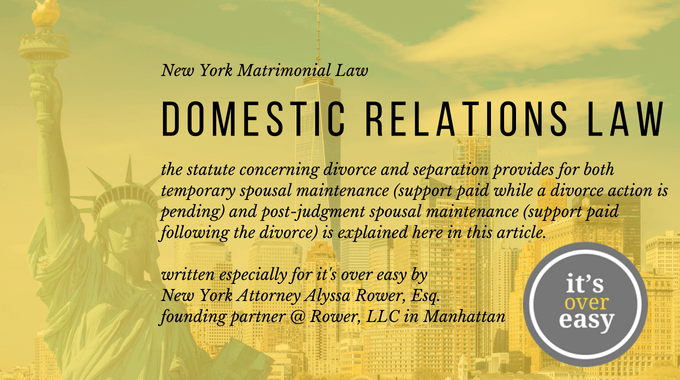 Ms. Rower illuminates for our it’s over easy readers the ways in which New York Matrimonial Courts might determine temporary spousal maintenance and post judgement spousal maintenance. In New York, the Domestic Relations Law (“DRL”), the statute concerning divorce and separation and the myriad of issues that arise in divorce and separation proceedings, provides for both temporary spousal maintenance (support paid while a divorce action is pending) and post-judgment spousal maintenance (support paid following the divorce). For couples whose income exceeds $184,000, determining the amount of maintenance becomes more complicated. A court is required to apply the formula up to the income cap; thereafter, it can award additional maintenance based upon its consideration of 13 factors (for temporary maintenance) and 15 factors (for post-judgment maintenance). For high income cases, maintenance negotiations are complex as each side considers the marital lifestyle, each party’s project post-divorce lifestyle, what the more monied spouse can afford to pay, what income can be earned from assets each side will receive after the divorce, and what, if any, income to impute to either spouse. When determining maintenance, a court may impute income to one or both parties based upon their education, experience. Thus, for example, if a formerly highly-paid husband is terminated from his employment, the court may impute income based on his historic earnings and earning potential, even if he is unable to find a new job. Similarly, a stay-at-home mom who has an MBA and work experience may also be charged with income, despite the fact that she is not working outside the home and hasn’t done so in many years. As for the duration of a post-judgment maintenance award, the DRL also contains an “advisory schedule” based on the length of the marriage. Courts are not bound by this schedule, however, and in appropriate cases, may order non durational maintenance (e.g., maintenance with no set end date). It remains unclear when the clock starts – as of yet, there is no case law that explains if the duration of post-divorce maintenance begins from the date the divorce action was commenced, from the date the parties enter into a settlement agreement, or from the date the court enters the judgment of divorce terminating the marriage. Presumably, since the schedule of duration is merely “advisory,” the court may exercise its discretion to determine when the post-divorce maintenance begins. Under the DRL, an award of maintenance must terminate upon the death of either party or upon the recipient spouse’s remarriage. Many people will also add to their divorce agreement that maintenance will cease upon the recipient spouse’s “cohabitation.” As cohabitation can mean many different things, it is important that your agreement spell out exactly what circumstances will constitute cohabitation to terminate maintenance in your case. The nice thing about using it’s over easy is that divorcing spouses can work together on the site to figure out a support amount that works for them.